Sixty Education Ministers developing policies for half a billion young people to help ensure that progress beyond the United Nations' Millennium Development Goals will improve the competitiveness of nations. 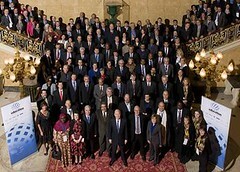 This was the World Education Forum in London last month. - Europe’s international educational benchmarks give everyone confidence that education qualifications are genuine and are awarded on merit. ‘Everyone’ means not just students, but families, teachers, prospective employers and, of course, the taxpayers who pick up the bill. - They underpin the internationalisation of education. OECD figures show three million young people from member countries are studying outside their country of origin. We’re regularly approached by UK education providers interested in two-way education initiatives with Ukraine. That means more choice, greater affordability and better opportunities for young people in Ukraine and UK to learn more about each other. - International standards protect and support the academic freedoms that are essential for any society wanting to get the most from their intellectual and social capital. They also help attract the world class international research to which Ukraine’s leading universities and institutions aspire. The British Council is constantly working with Ukraine to help achieve European education standards. For example, we enjoy the confidence of Ukrainian policymakers, parliamentarians and business leaders by sharing experience and ideas for boosting skills for employability. Over 120 Ukrainian schools are linked to counterparts in the UK through our international online networking programmes supported by partners such as Microsoft, BBC World Class and the European Union. And to support quality in agencies in Ukraine offering services to potential international students, we run a certificated online course promoting the UK as a study destination. International collaboration has an essential part to play in educating our young people. It’s no longer a novel concept for a school, university or vocational college to have an international link. It is and should be an expectation – and it’s good to work in Ukraine with partners who share this view. Only through international partnering, underpinned by the European standards to which Ukraine has committed, will we be able to enrich our education systems and equip our young people and leaders of the future.